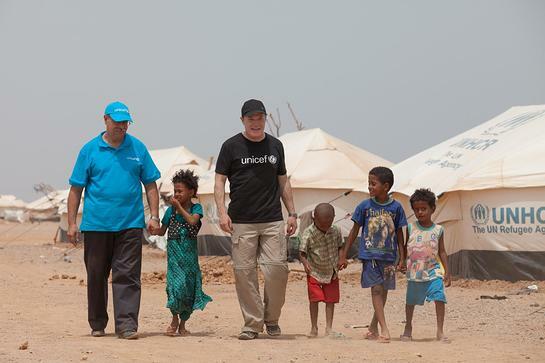 Earlier this week, UNICEF UK Ambassador Eddie Izzard met child refugees in Djibouti who have fled the devastating war in Yemen, the country of his birth. Eddie heard first-hand accounts from the children who fled with nothing, braving a perilous boat journey across the Red Sea. Many shared heart-breaking tales of loved ones lost, family left behind and homes destroyed. More than 20,000 people, including some 10,000 Yemenis, have made it to Djibouti since the conflict escalated in March. Thousands of Yemenis have registered as refugees and many are living in the Markazi refugee camp, just outside the northern city of Obock. UNICEF is working alongside UNHCR, Government and humanitarian partners to cover their basic needs in insufferable conditions – 47 degree heat, sand storms with winds of over 60 miles per hour, and an unforgiving desert. All of this set against a backdrop of explosions heard 35km away over the Gulf, in Yemen, reminding them of loved ones living through the torments of war. “For decades, the children of Yemen have been living in fear and danger. They are now living through the hell of civil war and many have had to flee across the Red Sea, to Djibouti via Bab-El-Mandeb – the Gate of Tears” says Eddie, speaking from Markazi refugee camp. Among the children Eddie met was 7-year-old Jawaher. She escaped the fishing town of Dhubab with her parents and four siblings. Her older sister Fatouma, 11 years old, remained in Yemen with her old and disabled grandmother. UNICEF continues to deliver essential aid to children in both Yemen and Djibouti. In Djibouti, UNICEF works with the Government and partners so that sick and malnourished children can access adequate healthcare and treatment, and to ensure access to water to the whole refugee population in the Markazi refugee camp. UNICEF is also supporting a back-to-school campaign so that Yemeni refugee children can continue their studies and regain a sense of normalcy in their lives, which is critical to help them cope with stress and trauma. As the humanitarian situation in Yemen worsens by the day, some 21 million people, 80 percent of the entire population, require humanitarian aid – and 10 million of these are children. Food, water and fuel shortages are pushing the country towards complete collapse. Yemen, the poorest country in the Middle East, already had one of the highest rates of chronic and acute malnutrition among children under five before the crisis – and this is likely to have worsened as the country enters its fifth month of war. UNICEF has established a logistical hub for Yemen in Djibouti and has been continuously sending vital supplies by boat to Yemen, such as medicines and medical supplies, nutritional products, and water, hygiene and sanitation supplies. Inside Yemen, humanitarian access remains a challenge and a humanitarian pause meant to provide a respite couldn’t take hold. UNICEF urgently needs £115.9 million for its work in Yemen to the end of the year. There is currently an 86 per cent gap in funding with only £16 million secured.